Since we have launched the app we have received questions regarding various difficulties encountered by the users. We have taken the most frequent questions and provided the answers on this page. You can use the Search bar below to find faster the solution for the issue you came across. Q. How often is the product feed updated? The app is updating the feed daily. Q. Is there a way to regenerate the feed or let the system update it? Yes. Just reinstall the App from the App store and the feed will start regenerating a.s.a.p. You will get notified by e-mail when it is done. Q. When exactly is the feed updated? Any specific time? Unfortunately, there is no specific time when the feed is updated. It is about every 20-24 hours, but there is no precise time when it's done. Q. I also have custom made items in my shop which don’t have a GTIN. Is the app generating automatically the missing GTINs? Yes, the app will automatically generate the missing GTINs for your products. The app might present some errors if you don’t have all the info on your website (e.g. the brand is missing for one of the products), but if you solve this kind of problems, everything should be fine. Q. Your app generated the GTINs, but now I have a 'Restricted usage GTIN' warning. The "Restricted usage GTIN warning" is present because your products are missing the correct GTIN values (barcode) in the shop. Our app generates GTINs for those products, but those GTINs are not registered, so Google gives a warning. If you would like to have official ones you should look for companies that sell GTINs and replace the generated ones with the registered ones. That is done in the barcode field in Shopify. However, this warning is not causing any problems. It will be shown as a warning and the products will be accepted. If you want us to disable the GTIN generation for the products, please contact contact@adwordsrobot.com and we can fix that for you. Q. Some product descriptions are missing from the product feed. What should I do? The app is extracting all the info from your website. If you have any descriptions missing in the product feed, that means you have some products on your website that do not have any description. In order to fix that, you must update the info on your website and the app will include all the details the next time it updates the feed. Q. I have all the product descriptions, but I get the 'Encoding problem in attribute: description' error. The encoding problem can be fixed by checking the products' descriptions. It might be the case that some products are having wrong/special characters or were imported in the wrong way. 1) You need to add a page (and a link in the footer) which explains how customers can return products and get their money back. 2) You need to add a page (and a link in the footer) which explains how much it will cost to get the product shipped. 3) You need to add a page (and a link in the footer) which explains where you are located, and maybe your address. You can add this in about us-page or contact-page. If you can include a phone number, that helps too. After fixing everything, you can request a review from Google support. Q. Does Google frown upon having every variant of the product in the product feed? Google likes to have all product variants, because it can show the right product to the users. For example, if you search for "red shoes", it would be much better for the user to actually see the "red shoe" and not a shoe which can be ordered in 10 different colors. Q. What if I don’t need GTIN’s for my products? How can I disable that in the app? If the product feed contains some fields that you do not need or do not want to be included in the product feed, just send us an email at contact@adwordsrobot.com and we will remove those fields manually to make sure everything will work properly. Q. My website is translated in multiple languages. Can the app create a multi-language product feeds? Unfortunately, the app cannot create product feeds in multiple languages. Q. Can I create the Shopping ads for multiple countries with your app? You can use the feed that our app generates for multiple countries. You will just have to create multiple feed definitions in Google Merchant (repeat the feed creation steps) and set up multiple shipping locations. Do note that you will still have only one feed with one destination URL and one price/currency per product. Q. Can the app include multiple images for the products? The app does not natively create the feeds with multiple pictures for the products. However, if you need the products to have multiple images, contact us at contact@adwordsrobot.com and we can discuss more details. Q. I am using the Shopify Shopping app already. Is it a problem if I use your app in parallel? No, it is not a problem. We can configure the feed generated for you, so you can use both apps without any conflicts. Just send us an email at contact@adwordsrobot.com and we will tailor the specifications based on your needs. Q. I would like to show products from only one collections in Google Shopping. How do I edit which products get synced? You can create a custom collection (with name staff picks for example), make that collection invisible and put all the products there you would like to be sinced. Please contact us at contact@adwordsrobot.com and let us know which collection you would like to be included. All products which are not in this collection will be excluded from the feed. Q. Can I use your feed for Dynamic Remarketing on Google? Yes, you can use the feed for Dynamic Remarketing, because it uses the data from Google Merchant. Q. My products seem to be included in other categories than the ones I use in the store. Not sure why this is happening. 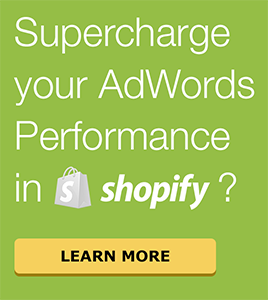 The problem might be because you are also using the Shopify Shopping app. Our app only reads the categories from your shop and does not change them. Q. I get the following error after installing the app: Oauth error invalid_request: You do not have permission to access the requested scopes. To use the app you need "Orders" and "Products" permissions for your user, see also Shopify Staff Permissions. Please ask the shop admin to set the "Orders" and "Products" permissions for your user. Or let the shop admin install the app first. Q. Is there an option to add a PROMO ID so the ads will show a 'special promotion'? We can apply a Promotional ID for products which match a brand or other keywords in the title, but because the app is free we only implement this 2 times per year. If you would need to use this feature more often, you can contact us and we can discuss more details. No question or answers found for your search term :( Contact our support team if you are in trouble.